Jet Airways flight 9W555 was a scheduled service from Doha, Qatar to Cochin, India. The airplane, a Boeing 737-800, departed Doha at 19:52 hours UTC (Aug 17). The flight from Doha to Cochin was uneventful, however due to presence of low clouds below decision altitude (DA) in the approach path for runway 27 at Cochin, the crew carried out a go around at 23:58 UTC. A second approach to runway 27 at 00:17 hours UTC (Aug 18) was also aborted. Around the same time two other flights, IX474 and KU349 also failed to land. After holding for about 33 minutes a 3rd approach was abandoned as a go-around was initiated by the captain at 00:50 UTC. While carrying out this third go-around the minimum reserve fuel became less than what was required for Bangalore, the designated alternate destination, hence the crew re-designated the alternate destination as Trivandrum. After the third go-around diverted to Trivandrum. The reported visibility at Trivandrum was 3000 meter. However after 9W555 came in contact with Trivandrum ATC, the reported visibility was 1500 m. Trivandrum ATC cleared 9W555 for VOR/DME approach to runway 14. The flight crew of 9W555 could not establish visual contact with the runway at Minimum Decision Altitude (MDA), carried out a go-around and declared "MAY-DAY" due to low fuel. After declaring "MAY-DAY" the captain requested ATC for permission to carry out a visual approach for runway 14. Thereafter the crew of 9W555 made two more visual approaches for runway 14 but failed to establish visual contact with the runway and carried out a go-around. The aircraft finally landed on runway 32 at 01:08 UTC after making total of seven approaches during the flight. After engine shut down fuel on board was 349 Kgs. 1. The absence of a company policy pertaining to the number of approaches/missed approaches in inclement weather led to the crew of 9W-555 attempting total of 07 approaches/missed approaches at Cochin and Trivandrum. 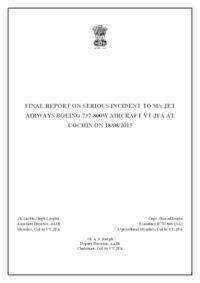 The crew also attempted 03 visual approaches at Trivandrum in below minima conditions, below circuit altitude and ignored several EGPWS cautions/warnings, thereby jeopardising the safety of the passengers and the aircraft. 2. The absence of a company policy pertaining to the re-designation of destination alternate during the flight in inclement weather led to the flight crew choosing an alternate, which was probably not the best decision given the available information and the prevailing weather conditions.